Young publishes articles, reviews and scholarly comment which develop and qualify international youth research. The aim of the journal is to contribute to developing a truly interdisciplinary youth research field, where it is both possible to apply approaches of a single discipline and to integrate insights, perspectives and methods from different disciplines. Young addresses a broad scope of questions in the life situation of youth in the age of globalisation – questions that are related to increased mobility of people and commodities, hybridisation of culture and the sensitivity of young people to changes in the labour market, culture, urban and rural contexts, etc. The journal initiates and facilitates more intense dialogue between disciplines concerned with youth such as sociology, political science, pedagogics, psychology, anthropology, ethnology, cultural geographies, economics, criminology, law, history, media studies, gender studies, medicine, psychiatry, literature, musicology, film, theatre, linguistics and cultural studies. 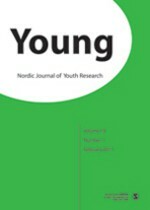 Young has a strong anchorage in the consolidated and respected research communities of the Nordic countries. It also has a keen interest in innovative developments and dedicated participation in the ongoing building up of European research networks, with the aim of globalising all areas of youth research.